As a children’s book blogger and mother to a toddler, I’m an equal-opportunity lover of books, from board books to novels, and I’ve learned to largely ignore age recommendations. That’s how I found Catherynne M. Valente in the children’s book section rather than general fiction, and, trust me, she’s not an author to miss, no matter how you find her. 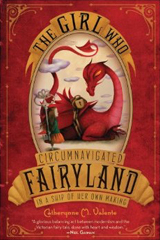 I first encountered Cat Valente’s books through her Fairyland series, novels which are listed for ages 10-14, according to the back cover. I’m 29 right now, by the way. I soon finished reading them all and delightedly reviewed them for my children’s books blog, The Children’s Bookroom, praising her for her ability to frame characters with such heart and personal growth, and to create a world so fantastical and yet so tangible.